I was born in the Uk. I have travelled extensively, now as a working mum I still love meeting people from across the globe. My husband and I used to live here before our daughter was born. Great metro conection to city centre and main sights. Silent environment. Our host was very nice and always responsive to communications. The apartment was clean and comfortable for our stay. It was also very close to a metro stop which made traveling to the center of Madrid very easy to do. Paola was very gracious! Paola was such a great host! She accomodated our late check-in and provided some snacks and drinks. After our long drive, we needed those beers. She gave us a brief insight into Madrid and helped with info on the best places to visit. The apartment is perfect for a couple- so cosy, clean and homely. The metro station is close and the trip into the center is short and easy. I highly recommend! Thanks so much for your hospitality Paola! A pleasure Teresa! It was great hosting you. I hope to see you again some day. Take care!! Cozy and super cute studio, ideal for two people, not too far from the center of Madrid by metro. Paola was very welcoming and she made our stay super easy, by calling us a taxi to the airport and leaving us a few useful things in the fridge for breakfast. Would come back again! My husband I spent 3 days in Paola’s lovely little flat. We enjoyed sitting on the balcony at the end of a long day sight seeing. We liked the location for its neighborhood feel and the short walk to the metro. The washer worked well and our clothes dried pretty quickly on the balcony. Thank you Ellen. It was a pleasure hosting you. My wife and a spent five nights here and we were very pleased with this property. It was close to a metro stop, groceries, and places to eat. The unit is very well equipped for cooking and living with great WiFi service. Our host Paola was gracious and informative. It is a small unit, best for a single or couple. Enjoy! 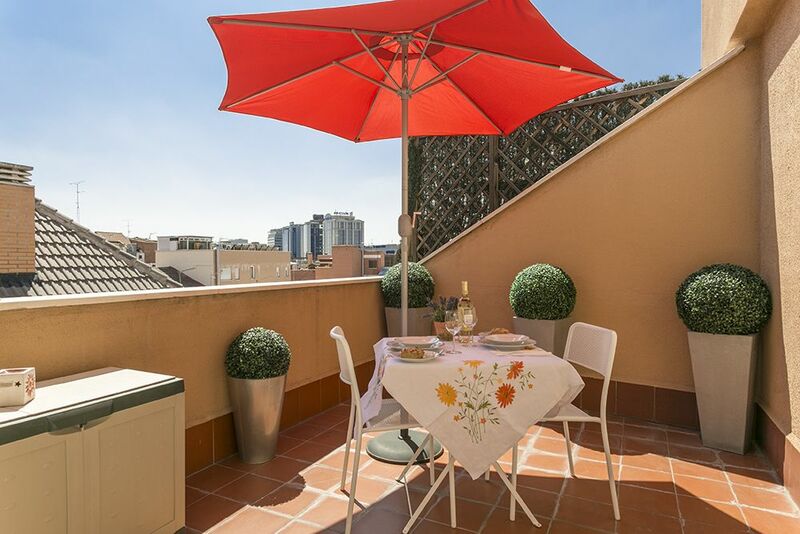 We loved our stay at Paola's condo in Madrid and has no hesitation to recommend it to others who may be looking for a fun holiday in Madrid. It is a small & cute place with everything in it and we loved it. It is very clean and comfortable with a lift. Paola had welcoming goodies like, juice, milk, bread, coffee etc. Who knows we may book it again next year for a week. Thank you so much Claudius. It was lovely hosting you. Please come back again. Have a lovely time in the Algarve. Propietario ausente durante la estancia. Checkin tardío > 22h suplemento 30€. Suplemento recogida aeropuerto 30€, preguntar a la propiedad. El contrato de arrendamiento privado, entre propietario e inquilino se firmará a la entrega de llaves.